Few towns have retained their character in this century as St Just, the first and last town in England, has. Once it was the mining centre of the peninsula and disused engine houses predominate the landscape. 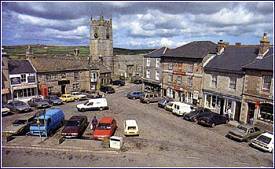 In the centre of the town is Plain-an- Gwarry, a theatre used for miracle plays in medieval times. The fifteenth century church includes part of the 1336 building and a three foot high pillar, the Selus Stone, with a Roman inscription and a Greek monogram in the north aisle was found 150 years ago. 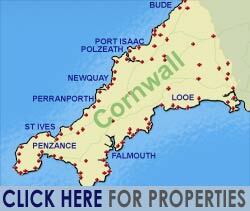 St Just�s history is typical of the whole area, rich in mining, farming and fishing from remote times. Everywhere can be seen monuments of this, often amid the moorland, heather and gorse. Carn Kenidjack - the Hooting Carn - the cliffs of Carn Gloose, and a path to Cot Valley, as well as the lovely valley of Nanquidno. The spectacular hump-backed Cape Cornwall, with its 138 year old mine chimney stack, is the only cape where two oceans meet in England. It rears 229 feet out of the sea to a summit which offers a 270 degree view over the Western Approaches��well worth the steep climb.. Rare plants and birds give the area an extra special appeal today. The headland in (mostly) managed under the stewardship of the National Trust. There is a small car park available - but no other facilities. 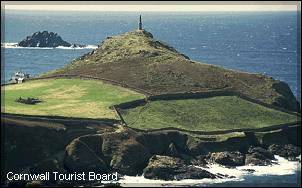 Cape Cornwall was a bronze age settlement - which along with the nearby cliff castle at Kenidjack was probably in use up until the Iron Age. The Brisons, are two offshore rocks, lying approximately 1.6 kilometers to the south west of the Cape. The rocks are 22 and 37 meters in height -their name comes from the French word brisant, 'reef, breaker'. The Brisons and the underwater reef that connects them Gribba Point, has caused many a shipwreck. See the Crown Mine engine house perched just above the Atlantic, the upper shaft of which extended 2,000 feet under the sea. "Nanpara" the farmhouse used in the Poldark series is also to be found at Botallack. The 2015 Poldark TV Series also features the Botallack Crown Mines and the rich mining heritage that can be seen around Botallack (just north of St Just) and Levant. 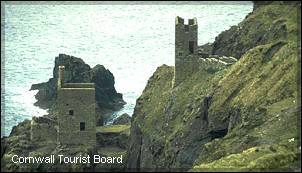 The Levant Mine was the setting for "Tressiders Rolling Mill" while Owles and Crowns near Botallack played the role of "Poldarks Wheal Leisure" mine. Formerly a major tin producing village, latterly production has ceased but its history is told at the Geevor Tin Mine Museum. Another popular attraction is the lighthouse. Walk the Hard Rock Trail through areas which convey the spirit of Pendeen�s past. A small village in a wild moorland setting. Spectacular cliff scenery from this part of the Land�s End to St Ives coastal footpath. The 15th Century church was used as a beacon for shipping. A lovely village between St Just and Penzance with an interesting Cornish church. A good starting point from which to explore the Beacon and ancient remains of Caer Bran and Carn Euny. Reached via the A30 road from Drift, where the reservoir offers excellent trout fishing.